The elegant simplicity of timber frame construction is made accessible to all levels of builders with step-by-step building instructions for one small, easy-to-build timber frame cabin, along with plans for modifying it to suit particular needs and locations. Jack A. Sobon is an architect and builder specializing in timber-framed buildings. A founding director of the Timber Framer’s Guild of North America and founder of the Traditional Timber Frame Research and Advisory Group, Sobon has devoted his 38-year career to understanding the craft of timber framing. Using only traditional hand tools, he has framed and erected over 50 structures. 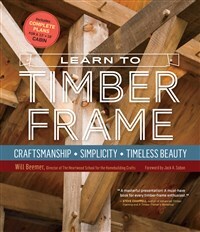 He is the author of Build a Classic Timber Frame Home and coauthor of Timber Frame Construction. A graduate of the Rhode Island School of Design, Sobon teaches and consults nationally on traditional building structures and timber-framing techniques.